Key Takeaway: The U.S., Russia, Jordan “de-escalation zone” in Southwest Syria advances the interests of U.S. enemies and adversaries, including Iran and al Qaeda. The U.S. likely sought to leverage the agreement to drive a wedge within the Russo-Iranian Coalition, while reducing violence and testing a potential partnership with Russia to improve security in Syria. The deal has temporarily reduced violence, but at great cost to long-term U.S. interests in Syria. The Russo-Iranian coalition is exploiting the agreement to consolidate in the south. Al Qaeda will likewise leverage the deal and the recent cut to U.S. support to vetted Syrian opposition groups to preserve and expand its influence in Southern Syria. 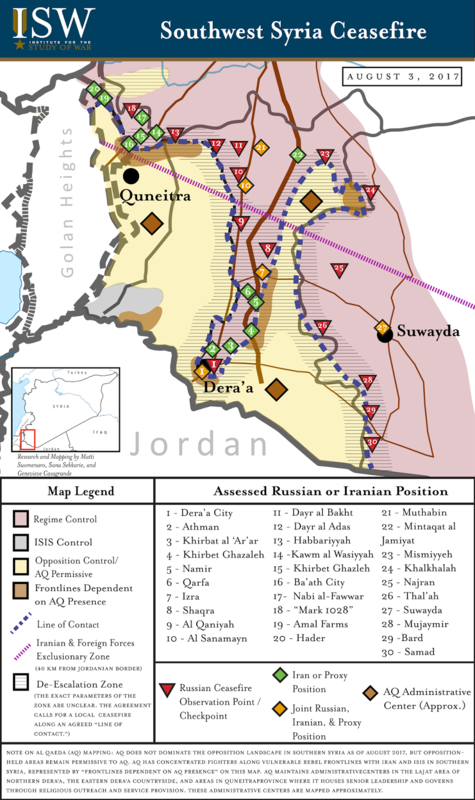 The de-escalation zone brokered by the U.S., Russia, and Jordan does not meaningfully constrain Iranian build up in Southern Syria and along the Golan Heights. The deal is rumored to include an “exclusionary zone” that requires Iranian and other non-Syrian forces to maintain a 30-40 KM distance from the Jordanian border. Iran and Hezbollah flaunted a large re-deployment away from frontlines in Dera’a City immediately after the de-escalation zone went into effect on July 9 in order to falsely demonstrate Iranian commitment to such an exclusionary zone to the United States. Most of the pro-Iranian forces relocated to areas just outside the exclusionary zone – including in the town of Sanamayn located approximately 50 KM from the Jordanian border – and to areas just outside Dera’a City, such as Athman. Hezbollah and other pro-Iranian forces retained many of their longstanding positions within the de-escalation zone and likely maintain some latent forces within Dera’a City, itself. Notably, the deal did not affect the historic pro-Iranian build up on the Golan Heights, a concern voiced by Israel in the weeks following the ceasefire. Iranian and pro-regime capabilities in the south remain largely unchanged. These local re-deployments and troop rotations still allow for Iran to quickly re-deploy to frontlines against anti-Assad forces as necessary. The de-escalation zone agreement secures the freedom of movement of Russia, Iran, and the Assad regime at the expense of U.S. partners. The deal has allowed Iran to temporarily shift assets away from previously contested frontlines like Dera’a City to reinforce other active fronts against the U.S. and partnered forces. Pro-Iranian and regime forces with Russian air support launched operations against historically U.S.-backed opposition groups in Northern Suwayda and Eastern Rif Dimashq Provinces following the start of the ceasefire. The deal has freed up the pro-Assad coalition to continue to further project force into Eastern Syria. Pro-regime forces backed by Russia and Iran advanced to the outskirts of Sukhna along the ground line of communication (GLOC) between Palmyra and Deir ez Zour City on July 28. Iran, Assad, and Russia seek to reopen this GLOC to besieged regime-held areas of Deir ez Zour. These advances would ultimately constrain the freedom of action of the U.S.-led Anti-ISIS coalition in Eastern Syria and could block further advances by the U.S.-backed Syrian Democratic Forces (SDF) along the Euphrates River Valley. Russian build up along the frontline stands to deepen the Russo-Iranian coalition’s penetration in Southern Syria. 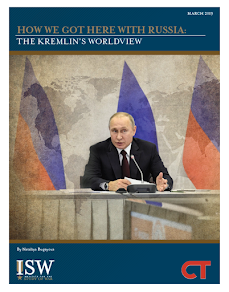 The deal lacks a legitimate, neutral enforcement mechanism and primarily relies upon Russian, Chechen, and Ingush forces to guarantee the agreement along the line of contact between regime and opposition forces. Russia cannot and will not restrain Iran and Assad. Russia deployed hundreds of military police including Ingush units to man observation points along the line of contact. The Russian force is positioned to protect -- not push back -- Iranian positions within this zone. The ceasefire deal allows al Qaeda to preserve its strength and expand its influence in Southern Syria. 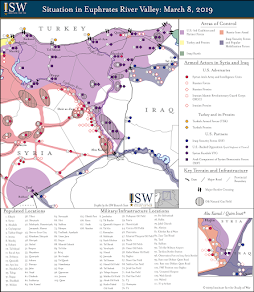 Al Qaeda had begun to reinvigorate its campaign to transform the Syrian opposition in its own image prior to the declaration of the de-escalation zone. Al Qaeda dispatched approximately thirty senior officials to Southern Syria in May 2017. Al Qaeda likely seeks to replicate its recent success in Idlib Province in the South. The ceasefire deal will provide Al Qaeda with time and space to further network itself within the opposition, including through local governance and security structures. U.S. President Donald Trump’s decision to halt some covert support to vetted opposition groups in Western Syria will only accelerate al Qaeda’s potential rise in the south. Syrian rebels have expressed dissatisfaction over U.S. demands to abandon the fight against President Assad and decreased U.S. support to rebels. Al Qaeda will exploit these grievances and attempt to fill the vacuum. Al Qaeda will position itself to eventually spoil the agreement, but will do so in a timeframe that supports its own interests. Special credit to Matti Suomenaro and Sana Sekkarie for their research contributions to this publication.